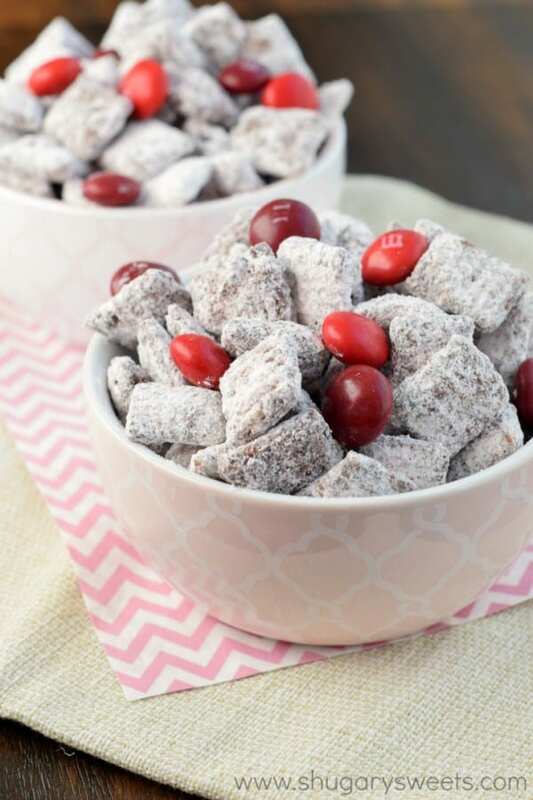 Instead of baking cookies, they have been asking for this sweet snack mix in their lunches! It’s hard for me to say no, since I love it just as much! This week, instead of making the original recipe, we changed it up some. I had a bag of Cherry M&M’S in my pantry and I decided to put them to good use. We mixed up the melted chocolate (I prefer to use this) with the Chex cereal. In a large ziploc bag I added the powdered sugar with the gelatin powder. Add the chocolate covered cereal to the bag, zip it closed, and shake shake shake! 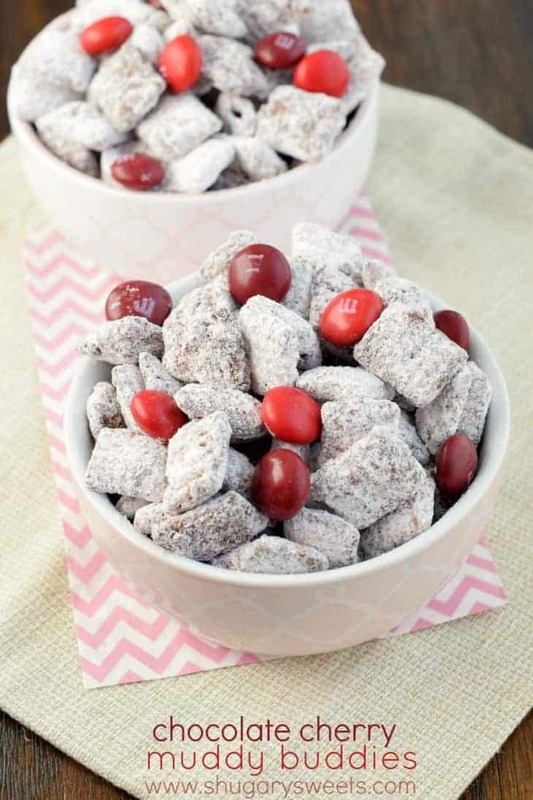 Once the cereal is completely covered with the powdered sugar, add in your M&M’s to the bag. This is one of the easiest snacks, and it’s perfect for Valentine’s Day. In a large bowl mix together the cereal with melted chocolate. Stir until completely coated. In a large gallon sized ziploc, add powdered sugar with gelatin powder. Shake until blended. Add in chocolate covered cereal. Shake. Shake Shake, until fully coated. Add in M&M'S. Store in covered container up to one week. ENJOY! 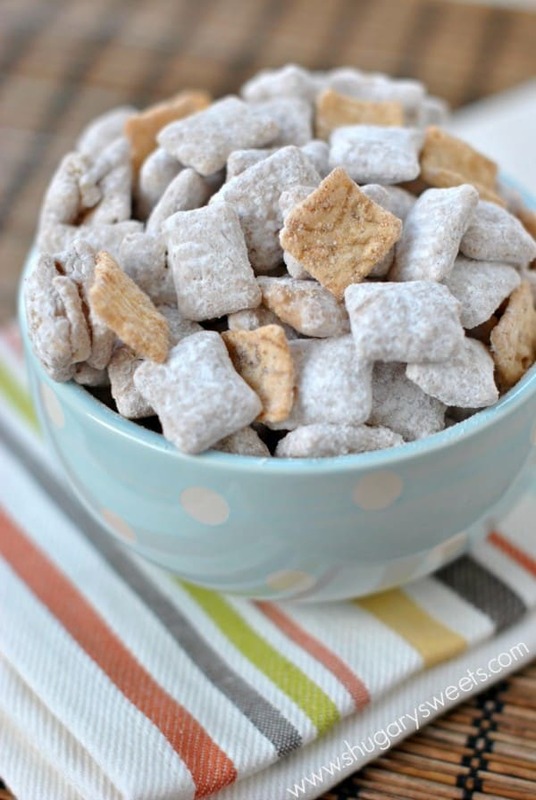 Snickerdoodle Puppy Chow: cinnamon sugar with a fun cereal surprise! 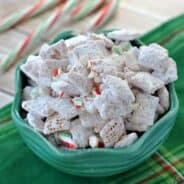 Hot Cocoa Puppy Chow: curl up with a cocoa and a movie and snack on this delicious recipe! Nothing says love like a new fridge! I think that’s a very romantic present. 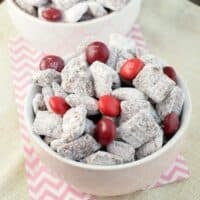 These are the coolest muddy buddies for V-Day! Chocolate and cherry can never lose! I agree. I’m not one to normally request household items for V-Day, but c’mon MICHAEL…my readers are hoping to see you listened, hahahaha!!! I have only tried muddy buddies once, and it was on Valentines day last year. But I didn’t really like it: they were very soggy: is that what they are supposed to taste like? I was always scared to try making them for myself in case I just get another batch of soggy sweet food..
Oh my gosh NO. They are supposed to have a crunch to them! Definitely NOT soggy!! We love Muddy Buddies too. 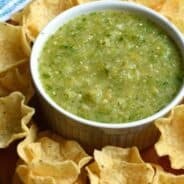 There are some many great flavor combos you can create. This one is perfect for Valentine’s Day. Oh yum, this looks so good! I love the red M&Ms. 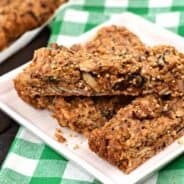 My kids go nutso for this sweet snack mix too! I have a fun Valentine’s version to share soon too 🙂 But now you have me wanting to make another batch with Jello!!! Love it! 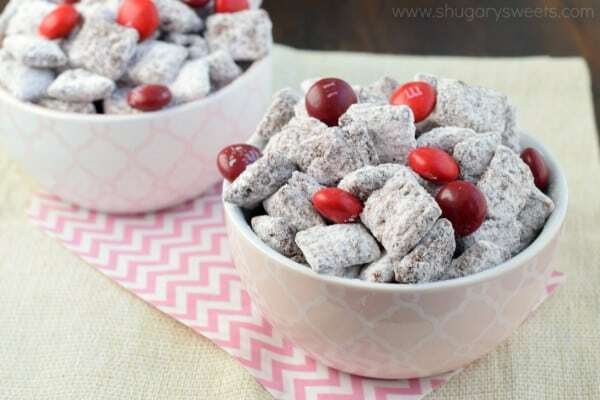 Oh wow this look so good, I love all of your muddy buddies mixes I have to try this one too! I haven’t eaten muddy buddies in so long! I need to make this for myself for Valentine’s Day :). I better keep my eyes out for cherry M and Ms! 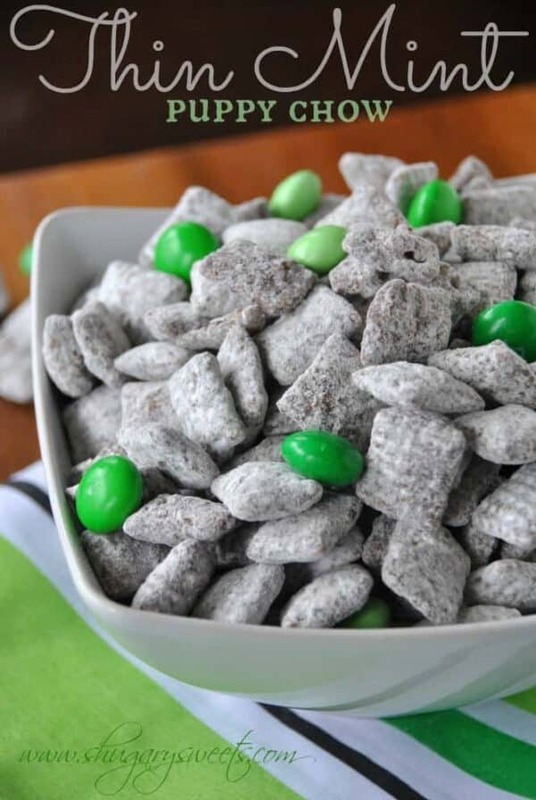 I only have muddy buddies when someone else makes them…that’s about to change. I love chocolate and cherry together, gonna try these this weekend! 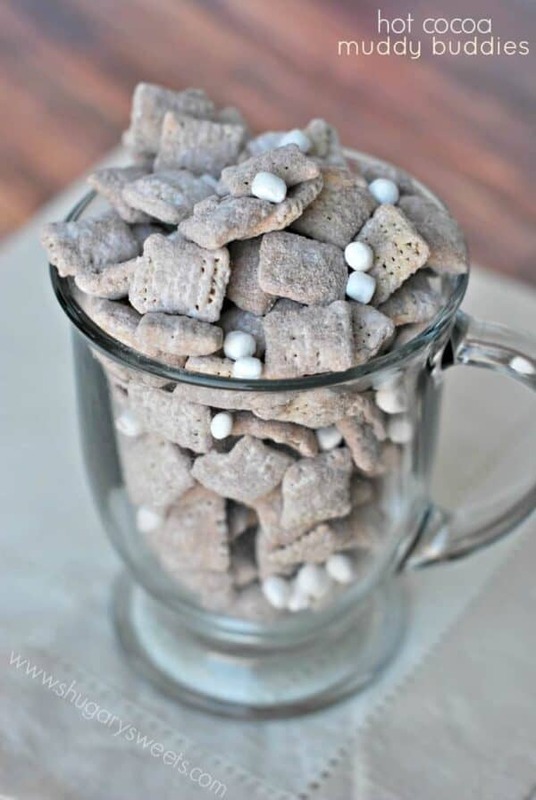 What a great method for making muddy buddies!! LOVE the flavors of this. I can eat a whole batch in one sitting! I think I’ve been living under a rock, I’ve never heard of Muddy Buddies! They look great, I def need to try these!